I get a lot of email in regard to Dark Shadows Online. People usually don't ask me about the DS storyline or things like that. Because I wrote The Dark Shadows Collectibles Book, I get questions about the DS collectibles -- what they're worth, etc. ; and since my book Barnabas and Company and this site are both primarily about the show's cast members, I also get a lot of questions about them. Also, people ask specific questions about Dark Shadows Online itself -- and I get lots of words of encouragement about my ongoing battle with colon cancer. (I'm deeply grateful for those messages; some days they really keep me going.) Following are the most frequently asked questions (and my answers). If you have a question not answered here, or suggestions about the site, please drop me a line: craig @craighamrick.com. Q: What motivated you to create this site? A: I became a fan of Dark Shadows through reading the Paperback Library books as a kid. (Read an essay about that.) In the 1990s I wrote my first book, The Dark Shadows Collectors' Guide (a revised version was later reprinted by Pomegranate Press), and several other fanzines (read about all those here). In the old days, fanzines were expensive to produce -- most of us did very limited press runs (100 or fewer copies at a time), so the cheapest way to do that was to use a copy shop like Kinko's, but still, it could cost $10 or more per book, so the profit margin wasn't very high. You usually lost more money than you made. Then in the mid 1990s, something revolutionary happened: The Internet allowed an inexpensive way to publish material and distribute it it to anyone in the world who has access to a computer and the Internet. As soon as I saw the 'Net, I knew I wanted to create a DS site and use a lot of that content I'd already written for my fanzines. So, that was how I started, and I've continued to write more and add more photos. 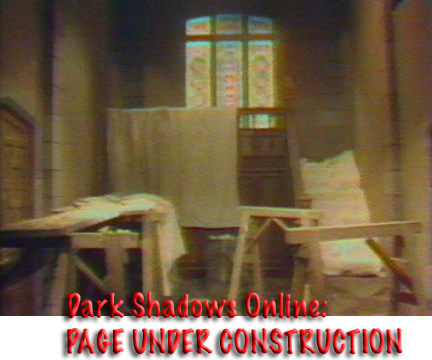 Q: Why isn't there more information on your site about the 1991 NBC revival of Dark Shadows? A: I decided to focus my site on the cast of the original show, and the DS collectibles, partly because those are the DS-related things I find most interesting -- and also because I think the more a webmaster can narrow down the scope of a website, the more unique and interesting it becomes. For example, other people have really great sites devoted to things like the DS movies, specific actors, and the show's storyline. Rather than spend time duplicating what they've done, I'd rather concentrate my research time on unearthing more info about the stars and collectibles. Check out my links page to see some of the other sites I'm talking about. Q: Why isn't there more current news about DS on your site? Q: Why isn't there more information about Roger Davis/Addison Powell/James Storm/etc. on the site? A: This site, like most on the web, is a "work in progress," so there are some actors I just haven't gotten to yet, but eventually I will. Also, over the years, for whatever reason, some DS actors (like Robert Rodan) have been a little press-shy; they haven't done as many interviews as others, so it's difficult to find information about them. James Storm is one of the actors I've had trouble finding articles about, and when I finally met him in 2003 and asked him to sign a copy of my book Barnabas & Company, he playfully asked, "Am I in it?" -- as if he wasn't going to sign it if he wasn't. I said, "Well...a little bit..." which seemed to be enough for him and he laughed. Q: Where do you get the information and photos on your site? Also, over the past 15 years, I've interviewed about 20 of the DS cast members, and a few of them have become good friends of mine. They've been gracious enough to give me access to their own scrapbooks and photo albums, which has given me a chance to share a lot of previously unpublished pictures and information. Primarily, I'm talking about Nancy Barrett, Marie Wallace, Diana Millay, Lara Parker, and Louis Edmonds. That's one reason that you see a bit more information and photos on my site about those actors than some of their castmates. I've also gleaned a lot of basic information from Kathryn Leigh Scott's excellent Dark Shadows books (available at Pomegranate Press's website). KLS has been writing and publishing these books for about 15 years, and every time I think, "She must be running out of DS topics to do books about," she finds a new angle, and another really enjoyable book is available. She's published volumes about the DS movies, the music (including sheet music), the DS comic strip, the 1991 NBC series, the DS collectibles (I wrote that one), and of course the original series. (She's also published books about other classic TV shows, including Charlie's Angels and The Fugitive, so if you're a TV buff, you should check out her site. And of course I've gotten a lot of info on the web. The Internet Movie Database and TV Tome, for example, are packed with great facts and figures about just about every TV show and movie ever done. Q: How often do you update the site? A: Unfortunately, because I've been on chemotherapy off and on since 2002, my energy level is a little compromised, so sometimes a lot of time passes between updates. Because of this, it recently occurred to me that I should add a page to the site that points you to the newest content. Click here to read it. Q: Can I use some of your information and photos on my website? A: I'm extremely grateful when people ask this, because over the years, an awful lot of webmasters have gone right ahead and grabbed stuff of my site without bothering to ask, so I try to give permission to do it if I can. (Sometimes, for example, when an actor gives me access to their personal photos, usually they ask me to try to be sure they don't end up on other websites or books.) But if a webmaster wants to use a lot of the info on my site, I ask them to just link to my pages instead. A few months ago, one of my friends emailed me a photograph of Nancy Barrett and wrote, "I don't know where my friend found this photo, but isn't it great?" I said, "Yeah, I thought it was pretty great when I got it directly from Nancy and posted it on my site a couple days ago..." So, in a case like that, I wish his friend had instead emailed people a link right to the page I'd put the photo on. That way, I might get some brand new visitors to my site, which is one reason I make the effort to unearth material you probably have never seen before. One big reason I maintain this site is to promote my books, so the more new visitors I can get, the better. Q: Is Jonathan Frid still alive? A: He's in his 80s, and he's very vibrantly alive. The last time I saw and spoke to him was at Louis Edmonds' funeral in 2001, and he'd just driven, alone, all the way from Canada to Long Island. He looked great, and though of course he was sad to have just lost one of his best friends, he was outgoing and friendly to everyone at Louis' wake. Q: Why doesn't Jonathan Frid attend DS Festivals? How can I write to him and let him know how much I appreciate his work on Dark Shadows? A: While he was living in New York City, Jonathan did attend quite a few Festivals and other fan gatherings. But then in the mid-1990s, he moved back to his native Canada and settled into a happy, quiet life. I think in some ways he got a little tired of talking so much about a show that he did for just a few years, almost 40 years ago, so he has distanced himself a little bit from DS -- but not entirely. For example, if you visit his official website, www.jonathanfrid.com, you'll see plenty of DS photos and information about that part of his career. But unfortunately for his fans, I think it's pretty unlikely that he'll ever attend a fan event again. As far as contacting him -- there really is no easy way to do so. He doesn't have an email address for fans (like Diana Millay does), or list a mailing address on his website (like Lara Parker, who lists a P.O. box on her site, primarily for ordering autographed items from her. but also for fan mail). But as a fan of Jonathan, you can rest assured that he's very aware of how many people have continued to enjoy his work on DS and other projects, and he deeply appreciates his fans. Though he basically considers himself retired, Jonathan does occasionally appear on stage throughout the U.S. and Canada. Keep an eye on his site for info about that. Q: Has Kate Jackson ever appeared at a DS Festival? A: No, she's one of the last holdouts. But she did appear at a tribute to Dark Shadows at the California branch of the Museum of Television and Radio in 2001, so maybe that can give us a little hope that she might eventually come to a Festival. Q: I sent a photo/book/poster/etc. to one of the actors to sign (or I've sent a note requesting that they send me an autographed photo), and it's been a couple months and they still haven't sent it back. Why do you think that is? A: It's important to keep in mind that when DS was still on the air, the stars had assistants to help them with their fan mail -- and when someone requested a photo, ABC paid for it, because it was good publicity. These days, of course they don't get as much fan mail as they did back then, but they also don't have any help (physical or financial) to handle requests. I know we all sometimes sort of forget that besides the type of work they do, actors are just "normal" people, so when you make an autograph request, or expect to get a written response to your letter, remember that you're making a slightly demanding request of someone you don't know. On a one-case basis, it's not a huge problem to sign something and mail it (but post-9/11, at least here in New York, if we're mailing anything fairly large, that means standing in line, sometimes for nearly an hour, to hand it over to the window clerk, rather than dropping it in a box.) Multiply that be even four or five requests a week, and that can become very time-consuming. Similarly, lots of requests for free photos (and postage) aren't really appropriate. It's asking (mostly) retired actors to spend money, which adds up. You should never, never, never send something rare and irreplaceable to an actor to sign and return to you. It's very possible, for a variety of reasons, that you might never see it again. And if you've sent it "blind" -- without first writing and making sure the actor is willing to sign it and take good care of it, and send it back soon -- you don't have much right to get angry with the actor if it gets lost, misplaced, sent to the wrong address, or whatever. Q: How much is my Josette's Music Box/ DS paperback/comic books/etc. worth? A: That's really difficult to answer these days, because eBay, the enormously popular online auction site has radically changed the collectibles market in the past several years. So I think going there and doing a search for the item you're curious about is the best way to find out what people are charging and paying for it. Practically every one of the common DS collectibles is listed there for sale just about every day. (If it's a rare item and you don't find it, keep trying every few days. It'll pop up sooner or later.) But keep one thing in mind -- just because someone is asking for a certain price, that doesn't mean anyone is willing to pay that much; to get a "real" value, you have to find an item that actually has some bids, or that have already been sold (you can search through completed auctions). Ebay has practically flooded the market with some collectibles that once were fairly rare. For example, before eBay, some items like the original music box toy (marketed while DS was still on the air), The Dark Shadows Cookbook, and items produced to promote House of Dark Shadows and Night of Dark Shadows, were difficult to find, and fairly expensive. Now, some of these aren't exactly cheap, but most are less expensive/valuable than they were -- and more obtainable. Why did these items appear, seemly out of nowhere? I think one reason is that before eBay, if, for example, someone rediscovered an ultra-rare, forgotten DS collectible in their attic, there weren't many ways for them to offer it for sale to DS collectors (or to find out what it was worth), so they'd probably just leave it in the attic. Now, it's really easy to list an item for sale on eBay, so a lot of people are doing it. Q: Do you have a favorite DS collectible? A: Even though I've written two books about the DS collectibles, I don't have a huge DS collection, but of course I do have some. What I do "seriously" collect is original comic book art, the pen-and-ink drawings that comic artists create as the first step in the comic book production process (later in the process, they're copied and colorized, etc. -- but the original black-and-white drawings are highly collectible, and many are beautiful pieces of art). My most-treasured comic art pages feature my favorite comic character: Lois Lane, especially those drawn by the late, great Kurt Schaffenberger in the 1960s. I also have a couple other items on display in my apartment -- one of the 1996 reissues of Josette's Music Box on a bookshelf, and a Barnabas standee (a promotional piece created by MPI in the early '90s) in my home office. But that's about it. Like most DS fans, I don't have a "shrine" devoted to the show. Q: What's the very rarest DS collectible?  The "Horror Head Pillows" are either rare or simply nobody's interested in collecting them because they weren't very closely tied to the show.  One-of-a kind things, like a specific actor's actual script (TV or movie) with their notes penciled in -- plus original props used on the show. Those are hard to verify; anyone can say they have a box or a book or a letter opener or whatever that was used on the show. How can you REALLY be sure? Some items have been provided by Dan Curtis Productions to the DS Festival and are sold at auction. (These have been things like the show's music cues on the tape cartridges that were used on the show; signs from the dressing room and rehearsal areas; license plates and things from Julia Hoffman's lab from the 1991 series, and the portrait of Josette from the original series.) Jim Pierson, chairman of the Festivals is one of the kindest and most honest people I know, and if there was a prop offered at a DS Festival that he said was real, I would bid with 100 percent confidence. Another source for the one-of-a-kinds is directly from the actors. Lara Parker, for example, sold a set of her fangs, and I know for a fact that Nancy Barrett still has her HODS fans and a dress she wore on the show. She toys with the idea of auctioning them one of these days. How cool would that be? Carolyn's fangs! And yet another type of one-of-a-kinders is original comic art from the Gold Key or Innovation comics.  Most of the things that were mass-produced (like the millions of copies of the paperbacks that were sold) will probably never be "rare." But they're one of my favorite collectibles, because they're how I discovered DS, rather than seeing it on TV. Q: Is Dark Shadows being aired on any cable channel? Q: Has there ever been a Dark Shadows cartoon? A: No, but at one point Dan Curtis considered creating one similar to Batman Beyond -- dark, moody, and gothic-looking. It still might happen someday. I think it'd be great, because it's the only way the story could be continued with characters played by actors who have died (like Grayson Hall and Louis Edmonds). I think some people might think they vaguely recall a DS cartoon back in the early 1970s, but they may be remembering Scooby-Doo, Where Are You?. The opening credits include a house that looks a lot like Collinwood, and a character with spikey bangs that resembles Jonathan Frid's Barnabas. Q: Is Dark Shadows the only thing you write about? A: Not at all -- I've been a professional journalist since I was 16 (my dad owned the local newspaper), so I've been at this for over 20 years, and I've written literally hundreds of magazine and newspaper articles. Most of my recent magazine work has been about technology (the Internet, computers, digital photography, etc. ), for publications like Computer Shopper, FamilyPC, and The Gateway Guide. But some of my favorite articles have been interviews with an eclectic mix of celebrities -- including Wayne Newton, Carol Burnett, Gordon Jump, William Windom, Stefanie Powers, Desi Arnaz Jr., and of course, many members of the DS cast. 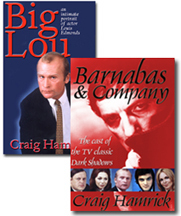 My most recent book features trivia quizzes about lots of classic TV shows, including Dark Shadows. For more info about it, go to TV Tidbits.com. Q: You're listed as "producer" of Nancy Barrett's cabaret shows. How did that come about, and what does a producer do? A: I first met Nancy when I interviewed her for my Louis Edmonds biography, Big Lou in 1997. And that day, as I was leaving her apartment, she casually mentioned that she was going to be singing for hospital patients a few days later, but that I probably wouldn't have any interest in seeing that. Of course I did want to see that, and I brought along two of my good friends and fellow DS fans, who got a big kick out seeing Nancy, who at that point had never attended a DS Festival. A few days later, I called Nancy to talk to her about that performance, and I told her that I thought it would be great if she put together a full-length show (at the hospital she was one of several singers, and she only did few songs), and performed it at a DS Festival. I knew the Fest-goers would be thrilled to finally see her, and would be an enthusiastic, supportive audience -- which was important, because she'd only recently started singing again (she had been in a Broadway musical many years earlier), and was a little unsure about what she was doing. The idea appealed to her. She'd dreamed of doing a one-woman cabaret show for a long time. Plus, one of the main reasons she'd never attended a Festival was that she felt like she wouldn't have anything to do there. She was a little reluctant to take part in Q&A sessions because she didn't feel like she remembered much about her time on the show. But having a show to perform would be a good reason to attend a Fest. So she said she'd do it, but only if I'd help her put the show together. I was happy to say yes to that, because it would be a good chance to get to know her better, and I'd always wanted to be involved behind-the scenes in "show business." Unfortunately, the next Festival was a little too soon to give us enough time to have a show ready -- plus it was in L.A., and I thought she'd be a lot more comfortable making her first Festival appearance in New York, because it's where she lives and she could invite friends to come see it. So, that gave us a little more than a year to work on that first show, which was much more than enough time. And, as I'd predicted, when she stepped out on the stage at the NYC Marriott Marquis hotel that next year, she got a standing ovation before she even said or sang a word, so that gave her a lot of confidence to "go on with the show." It's a lot of fun to have an impact on the shows. For example, when we were figuring out which songs Nancy would sing for the first show, we were having trouble coming up with an opening song. I said, "Have you ever heard 'As if We Never Said Good-bye,' from the musical Sunset Boulevard?" She had, and she agreed that the lyrics, about an actress coming back to a movie studio after not acting for many years, could be altered a bit to be about an actress attending her first DS Fest. It ended up being the opening song and the name of the show. Q: Why do you talk about your battle witch cancer on the site? It has nothing to do with Dark Shadows. A: What I'm going through is, to say the least, not a lot of fun. If there's anything I can do to help prevent anyone else from going through the same thing, I want to do it. I know this site has a lot of visitors, so what better place to "put a face on" this illness? And I'll be happy if even one person reads about colon cancer on my site and gets the information they need to prevent or catch the disease early. Her name is Victoria Winters...and when she arrived at Collinwood to work as governess, she was an orphan in search of answers about her past. Who were her parents? Was she a long-lost Collins? Did Elizabeth hold the key to the mysteries surrounding her heritage. Of course she did! The identity of Victoria Winters was not resolved on the TV series Dark Shadows, but years later two stories have finally answered that burning question: Who is Victoria Winters? In the 1990s, Dan "Marilyn" Ross co-wrote a novella called The Secret of Victoria Winters, which explained who he believed Vicky's parents were in the Parallel Time he wrote about in the Paperback Library books. And in 2003, David Selby's son, Jamison, wrote Return to Collinwood, a play that was presented at that year's Dark Shadows Festival. In the play, the reading of Elizabeth Stoddard's will at last revealed what Victoria's heritage is in the world dramatized on the TV series. Read The Secret of Victoria Winters, and Read About Return to Collinwood.